no longer fair game for a hearty meal. net if they spot a stranded cetacean. The following is a shortened version of the original article. Rare animals in Taiwan once wound up on dinner tables, and their ground-up products could be purchased in Chinese medicine stores. Current conservation values seem to have been set by the government and animal rights groups in less than a decade. Closer scrutiny shows they were more likely brought about by a handful of individuals who worked behind the scenes for years. 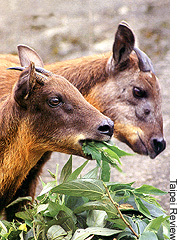 The Formosan Sika Deer was one of the "star" species of earlier conservation efforts. The government tended to focus on a select group of animals to whip up interest in animal conservation. The hotline at the Taiwan Stranded Cetacean Network rings with a call from a fisherman who has spotted two dolphins swimming in Chiayi County's Putai port. The fisherman speculates that the two mammals were lured into the area by the abundance of fish there and cannot find a way out. As soon as he has finished giving details of their whereabouts, the network dispatches a rescue team along with police officers, divers, veterinarians, researchers, the Coast Guard, volunteers, and fishermen. 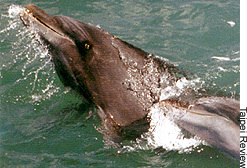 All of them work together to direct the dolphins out of the port and back into more familiar waters. A bare decade ago, a scene like this could have occurred only in the Chinese-language version of Flipper. Odds are the fisherman would have netted and brought the dolphins to shore so they could be weighed and butchered, and then placed on someone's plate. The fact that he made the call in the first place illustrates the nature and extent of the changes Taiwan has undergone since overseas scrutiny led to the passage of draconian laws as the price of escaping international disdain. The island's effort to protect marine life is not the only aspect of wildlife conservation that has seen an improvement. Every kind of creature in Taiwan--from the black-faced spoonbill to house cats--is better safeguarded than ever before. Animal protection here seems to have appeared like the thump of an axe, a response to the build-up of an international stigma that began in the 1980s. The change has been so quick that many foreign countries still regard Taiwan as not a good place to be an animal. The transformation was far from easy, given years of government-planned, gung ho economic striving in which animals had no role except as items for sale. Add to this the Chinese culinary tradition that utilizes every part of almost every animal, and traditional medicine heavily reliant on the body parts of rare species, and today's changes seem almost surreal. "What the WCL really did was specify which government agencies would take care of what tasks," says Fang Kuo-yun, chief of the COA's Resources Conservation Division. "It wasn't until relevant authorities were assigned to take charge and a budget was earmarked that conservation was able to get on the right track." It was most likely the threat of worldwide embarrassment, not an innate love of rare wildlife, that caused the ROC legislature to amend the WCL in 1994 by imposing stiffer penalties. Things had come to a head in late March of the same year, when the Convention on International Trade in Endangered Species (CITES) concluded at a standing committee meeting in Geneva that Taiwan's proposed actions "toward meeting minimum requirements have not yet been carried out.” Following CITES' decision, the United States invoked its Pelly Amendment to impose trade sanctions on Taiwan the following April, then went on to announce a ban on wildlife and wildlife products from Taiwan. "The economic impact of the ban wasn't substantial," Fang says. "What mattered was that Taiwan's international image had been drastically tarnished." 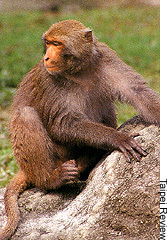 Don't cry for the Formosan Rock Monkey. pest, according to farmers trying to hold on to their fruit crops. NT$300,000 (US$9,677) to NT$1.5 million (US$48,385). and customs agents at airports, seaports, and along the coast. Those new measures and stiffer penalties worked. On June 30, 1995, the United States lifted its trade sanctions on Taiwan, and the island was removed from the Pelly Amendment's "Watch List" in September of the following year. Near -total recovery from international pariahdom was completed in February this year, when the Humane Society of the United States presented Council of Agriculture Chairman Lin Shiang-nung with a plaque in recognition of Taiwan's achievements in the field of animal protection, something the society had been monitoring since it first deployed representatives here in the early 1990s to observe and provide assistance. According to Chen Jiun-hong, an associate professor at National Taiwan University's Department of Zoology, while the government's education campaign has increased public concern for animal welfare, it has also been patchy in its effects. The problem is that many conservation activities focus narrowly on a select group of species. This attitude is a throwback to the earlier days of government education, when only a few animals were highlighted to arouse public interest in conservation. The Formosan Rock Monkey is one famous example of an animal that seemed to be in danger of extinction but then was raised so high in the environmental limelight that rapid proliferation has now made it a pest. Farmers frequently and vociferously complain that this once-hapless animal is now a threat to their fruit crops. Chen feels it is time for the government to enlarge the scope of its activities to include invertebrates. "Animal protection should progress from helping a few star species to comprehensive biodiversity," he says. "That's the only way the environment can sustain itself.” He would include species that are considered insignificant but have an impact on our lives, such as the earthworm, which fertilizes and ploughs the soil, and the fruit fly, which spreads pollen. Like many wildlife researchers, Chen believes that insects may have significant curative possibilities. "Medical science is still subject to limitations. We need to seek help from nature and utilize its abundant treasures, but we can't do that if everything becomes extinct." He is also urging the government to allocate more funding and manpower to comprehensive field surveys and research on the number, nature, function, and existing condition of all animal species, as a means of paving the way for more comprehensive conservation measures. Armed with the right data, the government would be able to draft comprehensive regulations affecting, for example, the harvesting of fish, crab and shrimp--something that is run-of-the-mill in many other countries but lacking in Taiwan. Huang Yuan-ching, secretary-general of the ROC Animal Protection Association (APA), also recognizes the improvements made here, extending the credit beyond legislation and other government efforts. "The media and several civilian groups have all joined hands to promote the concept of animal protection," he says. The association, established in 1973 to work with the government to protect animals, primarily organizes educational campaigns and activities. The APA's labour would not pay off until August of 1985, when the import of tiger bones and rhinoceros horns was outlawed. These animal products have been used for thousands of years in Chinese medicine. Finely ground tiger bones are used to ease rheumatism, while rhinoceros horn products are said to cure fevers and neutralize toxins in the body. The banning of these products in 1985 was not quite the end of the story, and succeeding years saw a number of news reports and exposes by overseas animal welfare groups of them still being available. Nowadays, however, they are as good as gone from the shelves, according to Jennifer Kuo, a pharmacist with the Sun-ten Pharmaceutical Co. "It's pretty difficult, or even impossible, now to buy tiger parts and rhino horns in local medicine stores," she says. "Few people dare to flout the law because of its heavy penalties." stay in one place, thus becoming easy-to-locate prey. Conservation Law took ten years to come into force,"
responsibilities of pet owners as well as the government's,"
punished. It's not about slogans, but the government's policy of protecting animals.” The law also provides that all dog and cat owners must register the birth, acquisition, transfer, loss and death of their pets, and arrange for them to have microchip identification implants. New laws regarding house pets have made dialogues between animal rights groups and lawmakers more common, one of many signs that the government is no longer ignoring activists. "The laws are comprehensive and the government has done a good job enforcing them," says Liu Shen-lang, chairman of the Animal Life Welfare and Environment Quality Association. But the Animal Protection Law, which she tirelessly lobbied for and helped draft, has turned out to be something of a disappointment. What upsets Liu the most is a provision that says pets without identification, or those that go unclaimed after their owners have been informed that they are in the pound, must be put to sleep. "The spirit of the Animal Protection Law should show respect for the lives of animals, and humanity should prevail when resolving the stray dog problem," she says. In response, the COA's Chen Bao-ji says that some animal rights groups ask too much. "The promotion of animal welfare is our objective, but improvements don't just happen overnight," he says. "Some of the appeals we get from civic groups are just not reasonable or feasible.” The government fully supports the notion of encouraging more people to adopt strays, but the sad fact is that putting stray cats and dogs to sleep is the only way to clear Taiwan's cities of packs of roaming animals, many of them diseased. Exchanges between the government and animal rights groups will continue and are actually a sign of progress in a country that got off to a very late start where animal protection is concerned. From being stigmatized as the worst place an animal could live, to being honoured by the Humane Society of the United States, Taiwan has come a long way in a short time. There is still a way to go, however. Many of the island's consumers already try hard to eat only free-range eggs on principle, but Taiwan is short of arable land, and farmers, like farmers everywhere, often seem to be more concerned with profit than with the welfare of the pigs that generate it. Stories of animals crammed into inadequate pens resurface with depressing regularity. The question now is whether concerned activists can prevent complacency from setting in and spur the government on to the next set of animal welfare goals.